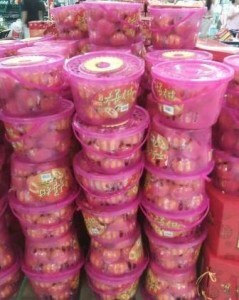 Chinese New Year (CNY) is around the corner- this year it will fall on Valentine’s Day (14 February 2010). Usually Mandarin oranges or “kam” are available during this Chinese New Year session- during other times of the year, only the smaller versions are sold. For the Chinese, “kam” has the same pronounciation as gold in Cantonese. As such, the mandarin oranges will be placed all over the home and exchanged between the guest and host. Because during festive session gatherings will tend to sit around and chat, with the Chinese cable TV in the background, most people will conveniently reach for the mandarin orange. However, for years I’ve noticed that a number of people develop throat irritation and itchness after eating mandarin oranges. I suspect it is the preservatives that went into ensuring the fruit does not rot- because as you open certain mandarin oranges, even though it looked okay on the outside, the inside actually have fungus or had started to rot. Given the hot session, mandarin orange- which by itself is heaty and compounded on the fact that a lot of people tend overeat in cookies and fried foodstuff and do not drink enough of water, the irritated throat can easily turn to a sore throat. I used to recall that after the Chinese New Year, a number of my colleagues will come back with hoarse voice. And mandarin oranges seemed to be too high on sugar content compared to other fruits. Therefore, my advice is that you may want to consider eating mandarin oranges sparingly. Oranges made good substitutes.